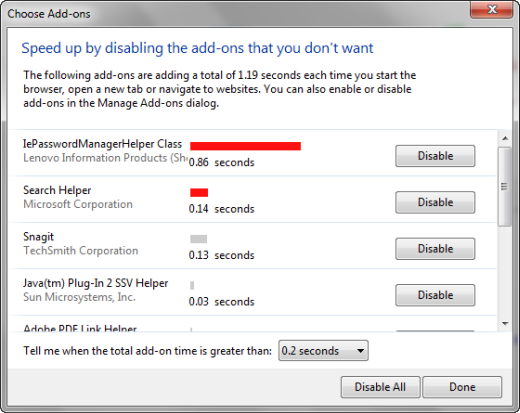 Internet Explorer 9 has a handy feature that shows you which add-ons are slowing down the load time for the browser. So far, I haven't seen this feature from any of the competition and it's very telling. For instance, I hadn't ever noticed that Lenovo puts its own password manager in IE until launching IE9 for the first time and seeing that the Lenovo password manager add-in increases IE9 launch time by almost a full second. If you feel like you're waiting forever for the browser to launch, some of those extras you installed.